Compare prices from several car hire companies in Seville and find the best price for car rental. Our prices always include unlimited mileage and insurance. Seville is located in the southwestern part of Spain and is a major inland port that is associated with the Atlantic Ocean via the River Guadalquivir. This is the country’s 4 largest city with a population of over 700 000 (2009). 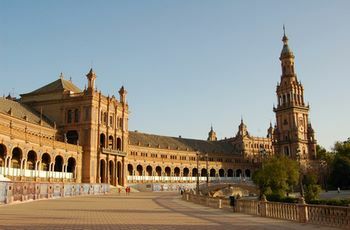 In Seville, there are many museums, parks and a town where several of the buildings are listed on the UNESCO list of world heritage. One of the most famous attractions is the Gothic cathedral, one of the world’s largest. The cathedral was built in the 1400s and consists of parts from a mosque which previously stood on the same site. In addition, you can visit the Moorish Alcázar from the 1100s. Airport Seville – San Pablo Airport is located about 10 km outside the city and offers international flights.